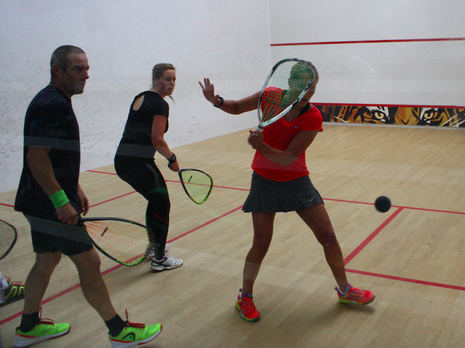 This was the first time that UK-Racketball had run the National Racketball Doubles and it was a great start to the event. In its first year 25 pairs took part and almost every event was contested. The mixed grade was the biggest draw of the day and it did not disappoint. 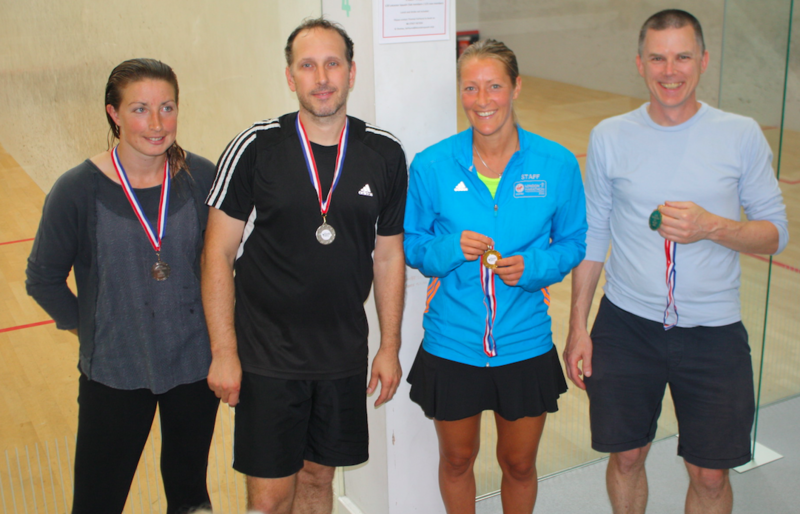 The local pairing of Martin Thompson and Leslie Sturgess defeated Andy and Tanya Ruff in a tight 2-1 before being beaten by Series regulars Dan and Vicky Soar. This set up a decider between the Soar’s and the top seeds in Group A. 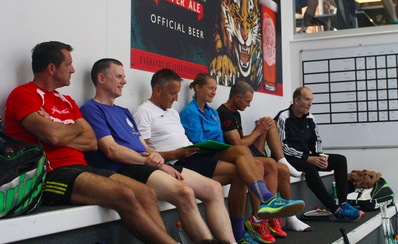 National Champion Natalie Lawrence who partnered Over 40s National runner-up Paul Johnson. It was a good match with some great retrieving from both Soar’s who consistently hung in rallies while under pressure. The hard hitting from Lawrence and ball placement from Johnson was in the end too much with Lawrence and Johnson going through to the final with a 2-0 victory. Mark Maddock and Helen Cann over came the challenge from Carolyn Lindsay and Ian Garvey before coming unstuck again Kelly Easthope and Jason Russel. Easthope and Russell were a strong mixed doubles pairing who almost defeated the groups top seeds Patrick Osborn and Zoe Mellis. Osborn and Mellis are both experienced Racketball players who displayed great accuracy throughout the match. Both Russel and Easthope showed great tenacity chasing down balls and fighting to keep a foothold in rallies but in the end it was not enough with Osborn and Mellis making it through to the final. The mixed doubles final was arguably the best match of the day. All four players are great singes competitors and looked comfortable playing doubles. Movement around the T was on the whole smooth resulting in plenty of long rallies. The women looked very evenly matched. Osborn maybe had the edge on Johnson in terms of accuracy but Johnson was moving slightly better. The result was a match that really could have gone either way. At match ball Mellis was drilled but a let was called, great sportsman ship and in keeping with the spirit of the UK-Racketball Series. Mellis and Osborn went on to secure victory 11-9 after some fantastic rallies. Follow this link to the video of the last few points. Top seeds in group A were National Over 40’s champion Richard Davies and runner up Paul Johnson. A formidable pair both renowned for making very few errors they were always going to be tough to break down. In the group stages the closest anyone got was Wayne Scott and Rob Last, a gutsy pair who moved fast, hit hard and took the game to Davies and Johnson. In the end experience and consistency was enough to see the top seeds through. Group B could not have been closer. Top seeds Jason Russell and Alex Hill defeated the local pairing of Martin Thompson and Hans Billson the youngest and oldest in the tournament 2-1. The local guys almost defeated the strong pairing of Dan Soar and Andy Ruff again missing out on the wrong side of a 2-1. In the group decider it was Soar and Ruff who defeated Russell and Hill again 2-1 to set up the final! The final was a very good game of Racketball doubles. Plenty of retrieving, mix ups and attempts to disrupt rhythm but it was the ever consistent Johnson and Davies who came through to claim their first National Racketball Doubles title. 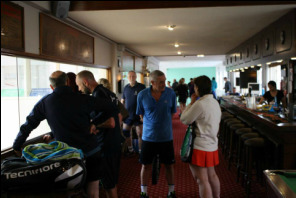 The Over 40’s was a straight final between the two pairs in a best of 5 format. On the day Paul Johnson and Richard Davies got the better of Michael Wardle and Spencer Harris. Wardle and Harris failed to convert there formidable singles play into the doubles format with Johnson and Davies playing consistently throughout the match. Carolyn Lindsay and Leslie Sturgess played well to beat Vicky Soar and Tanya Ruff but did not have enough to defeat Kelly Easthope and Zoe Mellie. Soar and Ruff retrieved well throughout the day. Lindsay and Sturgess hit well moving the ball into good areas but Easthope and Mellis both retrieved well and hit hard and accurately when given the opportunity. A title for a pairing formed at the last minute. The top seeds in both groups progressed through to the final. Patrick Osborn and John Cordeaux were pushed hard by Paul Fennell and Matt Hibberd but in the end overcame the challenge 2-0. In group B Wayne Scott and Rob Last put in a very gutsy performance against Stephen Widdison and Peter Edwards but did not have enough to convert the win with the experienced Yorkshire pair progressing to the final. The Over 50’s final was always going to be an accurate affair with both pairs hitting some great shots into space. With experienced Racketball and fantastic skills on display from both pairs it was maybe the fact that Osborn and Cordeaux had a slight edge on the retrieving front that took them through the match. 2-0 in a very high quality final! Hopefully this is the start of many National Racketball doubles tournaments over the next few years. For now the Series heads to Yorkshire for the Wakefield Racketball Open on the 9th of September! Click on the file below to see the schedule. You may need to zoom in. Click on the files below to open and see the draws for this weekends National Racketball Doubles. The schedule will be released tomorrow. If anyone has any problems please call me on my mobile 07846067505 and I will get back to you as quickly as I can. Please note that National Racketball Doubles rules apply for this event. Click here to see the rules in full. The UK-Racketball National Doubles Championships will be held at Leicester Squash Club as a one-day event on 19th August 2017. The Doubles Nationals has built up a strong foundation over the years and has always been associated with UK-Racketball. This year we are looking forward to building on past successes. 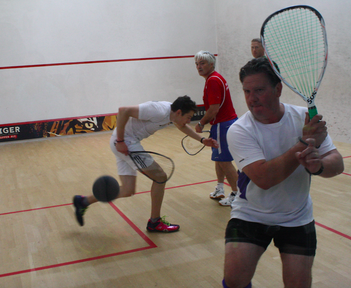 Leicester has a solid racketball presence and hosts a weekly racketball club night every Wednesday. With five excellent courts and a friendly and lively atmosphere, Leicester will make a good host for the National Doubles. 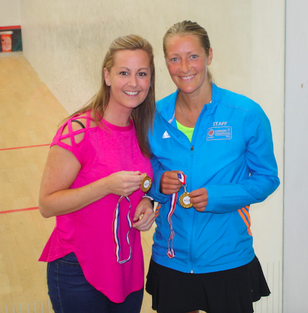 The UK-Racketball National Doubles Championships is open to all ages and abilities. Whether you’re looking to take on a new challenge or chasing a top title, this is the tournament for you. Although the A grade does attract the best racketball players in the country, the events really are for all players. We have never had a competitor who felt they were not good enough for an event in which they have taken part. The UK-Racketball Series was founded on the principle of being accessible and open to anyone, no matter what their standard or grade. This is the ethos with which we run all our tournaments, and will be the same focus for the Doubles in 2017. Prizes are given out to the winner and the runner up for each grade. All winners and runners up will receive a trophy. Winners from previous rounds will referee the next match on that court (the same rules that apply to the UK-Racketball Series). Women’s Championship - All ages and abilities, these events have a great range of players which makes for a fun and competitive day. 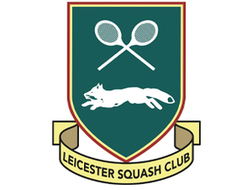 For more travel and club information call the Club on 0116 270 8068 or visit Leicester Squash Club's website.